It’s that time during my service where I have to fundraise! As I’ve written plenty of times on my blog before, my main secondary project has been getting my school’s library functioning. I took on the challenge to help coordinate a Peace Corps library project – Project Amandla (power in isiZulu) — with an American nonprofit called Books for Africa. Books for Africa will send a container of 22,000 English books to anywhere in Africa if the recipient(s) fundraises the shipment costs. My school will receive 733 books through this project to enhance our library. Additionally, the secondary school in my village will receive 733 books. I plan to allocate a few months next year to developing the secondary school’s library. “Amandla” means “power” in isiZulu – because reading is an infinite and undeniable power any child can harness if he or she has access to grade-level appropriate books. Through Project Amandla, my learners and approximately 16,000 other South African students will be given the power of literacy. The day I opened my library, my grade 5 girls were skipping around the library (and doing some Zulu traditional dances) because they were so excited that it was finally opening. 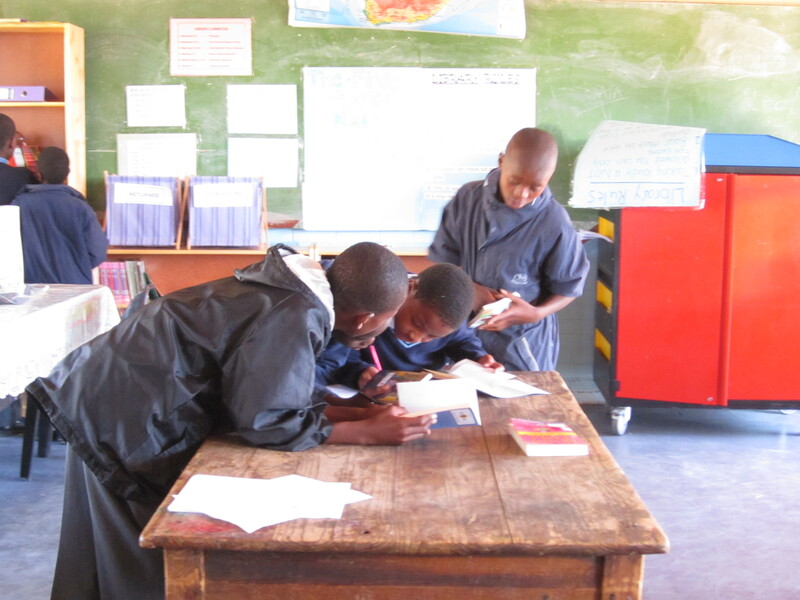 Dumsani, a grade 6 learner with “special needs”, checks out a book from the library nearly every day. Nolwazi, one of the brightest grade 7 learners, read the only series of chapter books we have within two weeks. That one kid Sebetsang, who I’ve written about before, has been reading Roald Dahl stories that are giving him inspiration for more of his stories. Spheamandla, the learner I detailed in my project’s description, is in the library during ANY free time at school – reading anything and everything he can get his hands on. My grade 5s will have read every book my school owns that is at their level by the end of this school year. Two libraries in my community will help these kids take ownership of their education by enjoying reading and thus developing their English vocabulary and comprehension skills. To donate funds, view our project link on the Peace Corps Website here: https://donate.peacecorps.gov/index.cfm?shell=donate.contribute.projDetail&projdesc=13-674-004; $20 will send 15 books to my learners! For more information about Project Amandla, please read the Peace Corps Partnership Program Grant I wrote that explains the background of my community, project implementation, sustainability of the project, desired outcome of the project, etc. Thank you for helping me make a difference in the lives of these kids who I love dearly and believe deserve a shot at a decent education. We hope to have these books in South Africa by October! 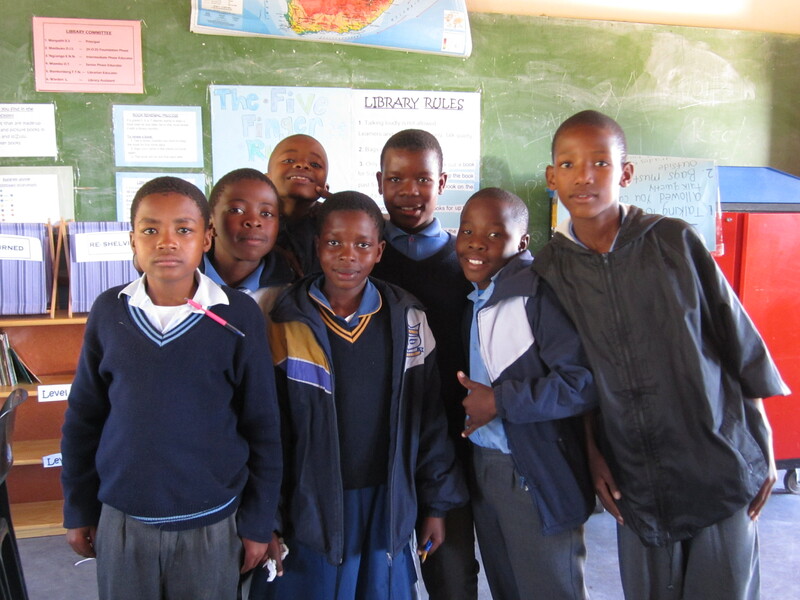 Nolwazi (center), Sebetsang (far right) and other grade 7 learners thank you! I posted this on my FB page and asked people to give $5 if not more…we’ll see if anyone responds.